Please use the Adf.ly download so I can get a few cents for my work from ad revenue. Or go to Curse Forge for direct downloads. 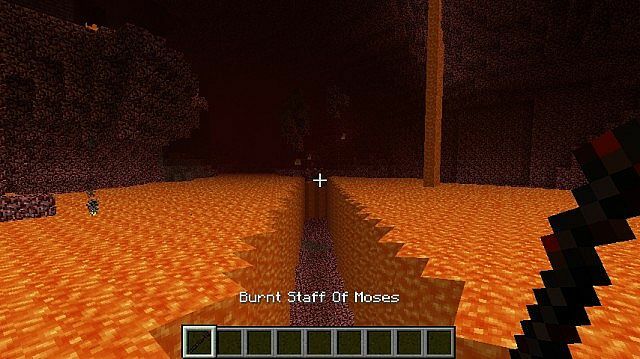 This mod introduces the item "Staff of Moses", which can be obtained with the help of a burning bush. With the staff equipped, right-click in the direction of water will create a passageto a dramatic music cut from "The Prince of Egypt"; right-click in any other direction or logging out will close all passages.One passage is maximum 5 blocks wide and 64 blocks long (it is now configurable); it may be narrower if the coastline is irregular (I might fix this someday). Hit stone with the staff to create a source of water. Left-click water to turn all water around into blood and back. As people have suggested, there is now a staff that parts both water and lava. This mod should work in single player and multiplayer. In order for the mod to work in multiplayer, it has to be installed both on the server and on the client. The installation process on the server is basically the same as on the client and is covered in the Minecraft Forge Wiki. 1. It is not crafted manually. 2. A staff is usually made from a stick, and a bush is usually something with leaves. 3. 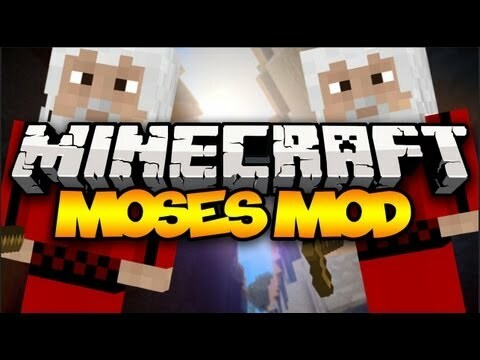 To obtain the "burnt" staff, the regular Staff of Moses has to meet lava. Hi, how many support you need to upgrade the mod for 1.11, or 1.12? And the links doesn't worx. Great MOD. Fox and I enjoy playing with it. Ohh, and BTW quick question, do you plan to make any other Bible mods? Awesome! Glad to see some Biblical mods in MC. I also like how accurate it is. Like how if you hit stone it can turn in into water. Even though a lava staff isn't Biblical (from how far I've read) its pretty sweet. Hope you update it soon, and God Bless! 0. Download Minecraft Forge, preferrably the installer;run it. 0.5.Run the version of Forge, then click "Quit Game"
1. Click "Edit Profile", then "Open Game Directory". 2. Find the mod downloaded. 3.Copy/Paste the mod into the "mods" folder (there should be one). is this mod in 1.6.4? Can you build underwater with this? 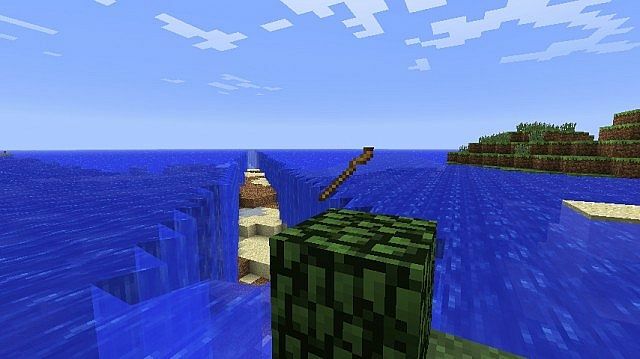 Or do the air blocks that take the place of the water just turn back into water as well? You can place a block and destroy it, and then the resulting air block will not be replaced with water. Otherwise the air turns back into water, yes. Okay now I hope I've fixed that bug. Again. Hmm... a Bible related mod, man, I just hope what always happens in the comments section of vaguely religious videos on YouTube doesn't happen here... anyways! Cool mod! I actually haven't seen anything like this, it's good to see an original mod being put out! Thanks! i have an idea! it should turn into a snake minion if you right clicking while sneaking, right click it again to turn it back into a staff. great mod! I am so glad I am not one of the only christians on this site! Thats cool, I am a fan of the Jewish. I'm a Christian though, so I firmly believe Jesus is the way. But still, I'm a big fan of the Jews (God's people). I love Prince Of Egypt! This is such a neat mod! Thanks! Nice! I've always loved this part of Exodus! wow from just a water splitting mod. 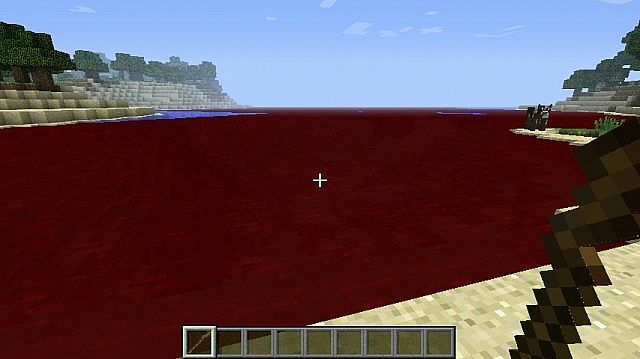 now with water into blood and lava splitter! Wow! just amazing! That would be awesome! I'd like to see more things like this. Oooh! Ooooh! You could use string all around and diamond block in the middle to make samsons hair! It would give you insane mining speed, uber strength and, resistance! Or you could surround a diamond block with 8 furnaces to make an Elijah's Altar! You could put food on it, and when you place water in a different slot, A fire charge would come from the sky, evaporate the water and instacook the food! Those are some excellent ideas, Herobrinebuster! The mod then should be renamed to something more like Old Testament. Oh, now I have an idea why it could have happened. Since I'm using dropbox for file hosting, I might have reached a day's limit of bandwidth that day you tried to download. However, the limit is pretty large, so I guess you were really unlucky that day, sorry about that. I hope I'll be able to move to a more reliable hosting someday. What page? I just verified that all the links relevant to the mod are working. Hey! Amazing Mod! 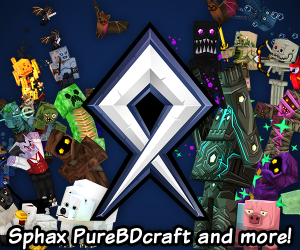 Love it, Check out my Showcase I did on it, Maybe put it on the page? Oh sweet, Thanks for putting my video on the page! Thank you, I really liked that video! Btw you didn't show the Burnt Staff which is even cooler than the original staff. And you can create water from stone. i will add this mod in my mod pack The Warriors in the next update! i'm a very athiest man but even i will agree this mod is awesome.